Title: Religious Pluralism: A Metaphorical Approach Author: Chris Arthur Philosophical and Cultural Studies in Religion Imprint: The Davies Group, Publishers soft cover 274 pp. USD 24.00 ISBN 978-1888570540 January, 2000 We live in a religiously plural world, one in which Buddhism, Christianity, Hinduism, Islam, Judaism, Sikhism, Taoism, etc., variously picture the nature and purpose of human existence. Which religious account, if any, should we accept, and on what grounds? Is it legitimate to construct a worldview using material from several faiths? Using the image of a hall of mirrors to symbolize our new multi-religious consciousness, Religious Pluralism: A Metaphorical Approach considers how the individual might answer such challenging questions. Religious Pluralism stems from a series of Gifford Research Fellowship lectures. A stipulation of these is that they be “public and popular,” addressed to the intelligent lay person, not just the specialist. Religious Pluralism is not written from any particular faith stance. It addresses issues that might concern anyone who thinks about religion, particularly the individual in search of, or interested in choosing, a faith. Contents 1. A Revolution in Religious Consciousness 2. Religious Pluralism as an Aspect of Globalization 3. Introducing Cipher and the Hall of Mirrors 4. Information as an Inimical Force 5. The Slap and the Salamander 6. Same House, Different Worlds 7. A Return to Beginnings 8. The Skull on the Mantel and the Burden of Goodness 9. Lessons from Three Elephants 10. A Sense of Timing. End Notes. Appendices: A. The Shri Yantra B. An Earnest Inquirer After Truth: Lord Gifford and the Gifford Bequest C. Acknowledgments D. Bibliography. Name Index. 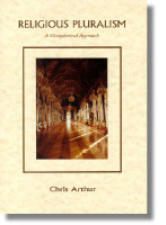 Subject Index Reviews “This is a brilliantly imaginative introduction to the issues of religious pluralism, using metaphors — the central metaphor of the hall of mirrors, and others — to express our natural puzzlement in face of the world religions as vast, impressive, and yet very different, pointers to transcendence. Chris Arthur writes in a clear, engaging way which makes the book a pleasure to read.” — John Hick “Chris Arthur is a pioneer in the serious exploration of religious pluralism and its effect on anyone wishing to find ultimate reality…. His is a rich account of how our perplexities can be guided towards spiritual experience.” — Ninian Smart Author Chris Arthur was born in Belfast and lived for many years in County Antrim. He worked as warden on a nature reserve on the shores of Lough Neagh before enrolling at the University of Edinburgh where he took a First Class Honours degree followed by a Ph.D. He has been widely published as an essayist and poet on both sides of the Atlantic. His work has appeared in The American Scholar, The Antigonish Review, The Centennial Review, Contemporary Review, Dalhousie Review, Descant, Event, The Honest Ulsterman, The North American Review, Northwest Review, Poetry Ireland Review, The Southern Review, The Threepenny Review, The Wascana Review and others. Chris Arthur was Gifford Fellow at the University of St. Andrews and is a winner of the Akegarasu Haya International Essay Prize, the Beverly Hayne Memorial Award for Young Writers, and the Theodore Christian Hoepfner Award.